This new game by Alea was the buzz at last year's Essen fair. There was only one prototype to play with, but even then, it already appeared on many "Top Games" lists. Unfortunately, I was not able to try it out, so it seemed a must to give the now published game a go. Alea has certainly come up with a hefty tome as a rulebook this time, but understanding the game is not as difficult as it seems at first glance, as the rules are extremely logical and leave little doubts once you have understood the signs on the cards. 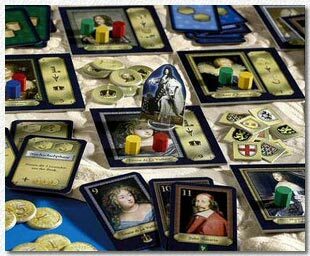 Players are nobles who work out intrigues at the court of the king, but this is not as strong an apparent theme as one would hope for, as this is a rather abstract, albeit extremely clever game of action management. It plays a little like an advanced version of "El Grande" with many original and new ideas on offer. Twelve nobles are on display as tiles, each using nice original portraits of the period. Players go through four rounds, which consist of several phases. Each player manages a handful of influence pawns that are placed on the various portraits for various benefits if you have the majority (and also if you don't). One can acquire "symbols" that come in handy when fulfilling "missions" (more on that later). Or "intrigue" cards, that enable a player to add to his own number of influence pawns AFTER all pawns are placed. Or additional "influence cards", that give you an extra go at the end of the 4 turn influence round (as you can imagine in a game about majorities placing last is a BIG advantage). Or one can "beam" influence pawns to somewhere else, either before or after they are "counted" (it is possible to leave pawns for the next round, thereby already having a majority which might discourage other players). Or "insignias", which count as 1 VP and might reap additional VP's at the end of the game. Last but not least you can go for money only (also important). All Tiles fall in three "counting" categories. "1st place tiles". These tiles are the trickiest, as only the player who truly has the most pawns will win the prize; the others go home empty handed. "Exchange tiles". These are safe but costly; placing the necessary number of pawns brings you the benefit without worrying about majorities. "Money Tiles". If you have the most pawns you get the prize for free, the others can also get the prize, but have to pay for it. Players work with two piles of influence pawns, like in "El Grande". One is "your own" and active, the other is the reserve. Moving the pawns from the reserve to your court counts as an action. Winning a prize means that the pawns you use wander into the reserve, but if you buy or trade prizes, your pawns will be immediately active again, so sometimes it is actually desirable to be second place. There is also a moving "Louis" figure, which means that being first in the designated tile enables you to reap additional prizes. All this sounds complicated at first and needs some getting used to, but it plays very logically. Placing pawns brings in a tactical element: You play influence cards that correspond to tiles. Only there can you place your pawns and "move" them on the "board" via diagonal connections. Usually you place 3 pawns, and each move means you have to leave one pawn there, so the maximum of tiles you can "influence" is usually 3 per card played (playing jokers means you only get 2 pawns). After the influence round is over the tiles are "counted" in numerical order, giving prizes to each player in turn. After you reap the prizes, the most important phase begins: fulfilling missions. Each player has two mission cards (in three categories: easy, 1 defined and 1 "any" symbol, medium two defined symbols, and hard, 2 equal symbols). Fulfilling the missions means expending the prizes (symbols) you managed to get. To fulfil one mission per turn is a must, fulfilling two or more is ideal. Each mission gives five VP at the end of the game, so these make up the majority of VPs at the end, but more importantly, they give you special abilities that give additional benefits like extra pawn placement or insignia income. The harder missions give better benefits of course, but the game only has 4 turns, so going for the one-time benefit of a hard mission in the last turn might not be a good idea. After the final turn, the insignias (who come in various designs) come into play when counting VPs. Now a majority in each design gives an extra VP, so a player collecting lots of insignias can make many points more through such majorities. This was perceived as the weakest part of the rules, as there is no way to influence the majority in insignias during the game, it is just pure luck of the draw. In a game which mainly consists of careful planning this jars a little, but one can easily leave away this rule. 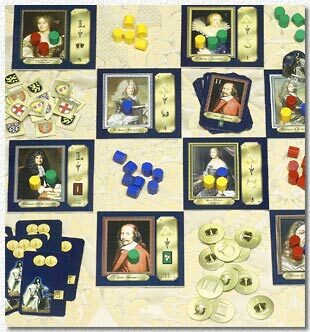 "Louis XIV" is a very challenging game that lends itself to many strategies. Going for insignia is sometimes easier than going for missions, but gives less VPs and no special abilities. But neglecting any aspect means failure, you carefully have to balance what you expect to gain and act accordingly. The turn order is important (the starting player changes, of course). If you come late, you can go for the risky prizes, if you go early or first you should plan a failsafe move, preferring "money" or "exchange" spaces. It is especially gratifying to place last when some tiles are still completely empty, actually this can happen quite easily if the other players are not careful. 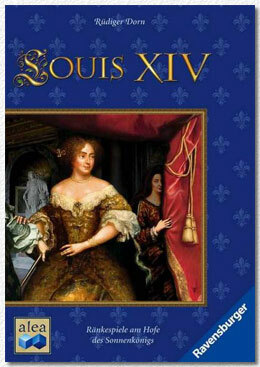 Nevertheless, "Louis XIV" is far from being a multiplayer solitaire game. Although it is impossible to hurt other players in unfair ways like stealing pawns or moving them around, it is very much possible to place them in a very annoying way. But the complexity of the calculations and interactions makes kingmaking very difficult, and also undesirable in a way. Our judgment? We were very impressed with this new Alea game and applaud Rüdiger Dorn for another great design. While certainly not a game creating a funny beer-and-pretzel atmosphere it will keep you engrossed throughout, a true gamer's game. Recommended!